Standard 2D - It's obviously the cheapest, but also the worst way of viewing the movie. RealD - it is the most standard way of projecting stereoscopic 3D images, utilizing cheap disposable polarized glasses and an alternate circular polarity projector. This can cause the unavoidable "ghosting" effect, which can blur the details of the 3D image. A sliver screen is required, in order to reflect as much light as possible and to prevent any viewing losses due to polarization. Brightness levels are usually low, and combined with the glasses and the silver screen tend to create a "greyish" haze that misinterpret the actual movie colors. 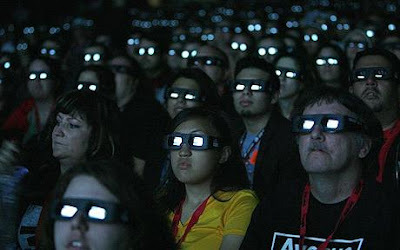 Dolby 3D - a more advanced but also more expensive method, it utilizes reusable passive glasses on a normal white screen. The projector uses a rotating wheel, spinning 6 times per frame, displaying the 3 basic colors (RGB) for the two stereoscopic frames. Gosting effects are not present, and the viewing experience is not affected by tilting. At 144Hz, no rainbow artifacts are created, similar to ie. DLP projectors. One disadvantage of Dolby 3D is the increased cost for the glasses. Brightness issues are natrually still present. XpanD - an even more expensive system, uses active LCD glasses that are remotely synchronized from the projection system to alternatingly block light from each eye using an LCD shutter. These glasses are obviously much more expensive, but several disadvantantages are countered, such as ghosting and tilting. Brighness levels are also improved due to the lack of filtering. IMAX 3D - it offers basically a larger curved screen and usually a more elaborate sound system. It uses cheap reusable glasses and a linear polarity projector. Brightness issues are rectified, due to projector intensity and screen size. One disadvantage of IMAX 3D is that viewer placement needs to be exact, due to screen curvature. If the viewer is not facing directly the screen, the stereoscopic perception is destroyed. This leads to fewer seats in IMAX cinemas compared to normal screens. I watched Avatar in Dolby 3D. Unfortunately the cinema that has an XpanD 3D system here in Heraklion is not showing the film. Looks like I will have to wait for another good film to see the differences between Dolby 3D and XpanD (and NO I am not watching "A Christmas Carol" just for the 3D). I just finished watching the Nighmare Before Christmas 3D in the XpanD system, and once again can verify its superiority - ghosting is almost non present, apart from scenes with very bright objects in a dark background. Brightness levels are ok, and to tilting or viewing angle problems whatsoever. Very informative article! I have to admit that during Avatar, I was so immersed into the movie that I didn't really realise any misgivings in the picture quality. Also, with no recent experience to compare it too I can only say that it was a great viewing spectacle. However, I'll be looking at it with a more critical eye next time... is that good or bad? Ignorance truely is bliss. Very Informative, thank you ebenet. As Hotshuk mentioned during the movie i could not be bothered to look for glitches. One thing to note though is that it took me 30 minutes or so until my eyes got used to it and almost double that for fast-paced scenes...It was truly awesome though! Your mistaken that RealD suffers from the 'head tilt' issues of older polarization technology. RealD uses circular polarization so that viewers can tilt their head without ruining the 3D effect. Hi Brian - I stand corrected. I watched Avatar in IMAX 3D which had linear polarization, thus losing the 3D effect when tilting my head. I also corrected the post.